← LEGO in the Village! As the 2012 Olympics kicks off in London, we at the Museum have been reflecting on the last Olympic games. It feels so much longer than two and a half years ago that the games were here in Whistler. As I write, the torch relay is underway- the Olympic flame is on its way to London. The actual transition of the Olympic flame is something that until now, I’d never given much thought to. As it turns out, the history of the Olympic flame and torch relay is pretty fascinating. The origins of the flame are in ancient Greece, where the flame was lit to commemorate Prometheus’ theft of fire from Zeus. The flame was lit throughout the ancient Olympics, but the tradition was not reborn in the modern Olympic games until 1928 in Amsterdam. The torch relay is more modern in its origins. The relay was devised as part of the Berlin Olympics in 1936 by a man named Carl Diem, and supervised by none other than infamous Nazi propagandist Joseph Goebbels. Since the controversial Berlin Olympics, the torch relay has been an important part of the build up to the games. The relay begins in Olympia, Greece, where eleven women representing the Vestal Virgins, light a flame using a reflection of the sun’s rays by a parabolic mirror. The Museum staff were debating how the torch could travel across the ocean, and whether it traveled by boat or plane. Apparently these days it’s pretty common to put the flame in a special container in order to take it on a plane, but for the Montreal 1976 Olympics, the flame was beamed by satellite. The flame from Greece was deflected, the signal was sent to Ottawa and the flame was lit by a laser. Talk about high tech! When the Olympic flame traveled across Canada, it had a number of interesting ways of being transported. When it was taken to Tofino, BC, it traveled via logging truck and canoe, where it was handed off to Raph Bruhwiler on a surfboard! When the flame traveled to Haida Gwaii, it traveled via a traditional Haida canoe carved by Bill Reid. While London isn’t literally taking up the torch from the Vancouver/Whistler Olympics, it feels like we’re passing off the Olympic spirit.It’s a great time to reflect on the Olympics and the celebratory, convivial atmosphere that the Games brought to Whistler. Good luck London and all the athletes competing in the 2012 summer Olympics! 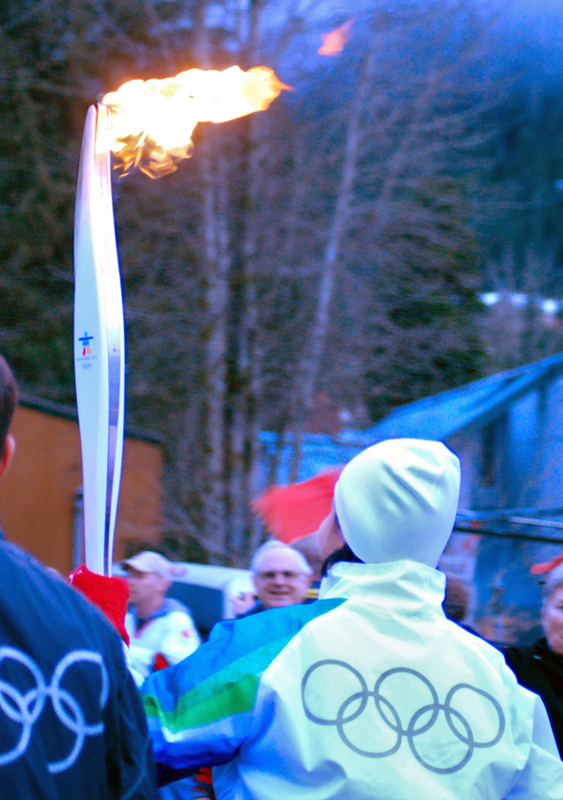 The Olympic flame in Whistler. If you’d like to see one of the 2010 Olympic Torches, drop by the Museum where we have one you can pose with!